From Jane Ellen Gertz of Armonk, New York on 12/27/2018 . An annual tradition that never disappoints! Thanks for your expertise in crumb cake making. From Michael Reynolds of Anderson, California on 12/26/2018 . It's the best available anywhere. My wife is born in Brooklyn and raised in Long Island and she knows. From Chris of Mahwah, New Jersey on 12/26/2018 . I sent your crumb cake as a gift to my sister in Florida, who can't get old fashioned crumb cake down there, and she said it was one of the best she ever had. Thank you so much! Just so delicious & yummy!!!! Arrived as promised and is delicious. From Anonymous of Margate, Florida on 12/16/2018 . So delicious. A huge hit as always. Yummy for the tummy. This is a yearly resend to family and friends, everyone loves it! thank you! From Elinor Molino-Myers of Scottsdale, Arizona on 12/3/2018 . We are still enjoying the crumb cake. Thank you. We miss New York good stuff! From Neal Grenley of Scarsdale, New York on 11/26/2018 . We had post-Thanksgiving guests who professed not to like coffee cake. The crump cake was demolished almost before the hosts could grab a piece for themselves. Yours is a wonderful product and we will definitely be ordering again. From Anonymous of new hyde park, New York on 11/26/2018 . From Maryann of Farmingdale, New York on 11/25/2018 . Best gift and always a huge hit! Perfect as gifts and always the biggest hit!! From Mary Clooney of Staten Island, New York on 11/18/2018 . Sent a Hahn's crumb cake to my nephew in San Fran..last year a bucket of crumbs..he loved them both..delivery was efficient and on time!..definitely would do again..
From Connie Kopperman of Pearl River, New York on 11/13/2018 . This is terrific crumb cake because there are a LOT OF CRUMBS! The ratio of crumbs to cake is very good, and the cake itself is also tasty. From Kevin of Deltona, Florida on 10/18/2018 . We are originally from Long Island,NY. We miss the bakeries from up there, so to get a taste of New York was absolutely wonderful. The crumb cake was just as we remembered and delicious. We will definitely be exploring other flavors and items. Thank you for shipping your awesome cakes down south. Warmest wishes to all. Thanks! From Anonymous of Oxford, Mississippi on 9/23/2018 . From Anonymous of Floral Park, New York on 9/17/2018 . Sent this cake to my nephew, in no Carolina and he didn't want to admit it but it almost better than his mom's..
From LeeAnn Kent of Fair Lawn, New Jersey on 8/28/2018 . From ronald richards of sparks, Nevada on 7/8/2018 . From Anonymous of Rogers, Arkansas on 6/18/2018 . The crumb cake is so delicious and the delivery was quick. From Ellen Duggan of Silver Spring, Maryland on 5/27/2018 . From Anonymous of Madison , Mississippi on 4/3/2018 . From Jerry Martellaro of merrick, New York on 4/2/2018 . I purchase your crumb cakes periodically for my family on the West Coast, they are head over heels in LOVE WITH THEM!!! From Allan Wysmuller of Randolph, New Jersey on 4/1/2018 . My ShopRite suddenly didn't carry the Crumb Cake which was a special treat for me. When I looked Hahns up on the internet and found I could order direct, I did so immediately! Not cheap, BUT worth every penny if you happen to be looking for the best crumb cake. From Diane of Farmingdale, New York on 3/22/2018 . I shipped a plain crumb cake to my family in California because it is difficult to find crumb cake out there. The cake arrived on time and in perfect condition. My family thoroughly enjoyed it saying it was moist and tasted excellent. It came with instructions on how to freeze, etc. There portion was large (I sent to 2 people) and they froze half for another day. From Anonymous of Lincroft, New Jersey on 3/19/2018 . From Anonymous of Bryan, Texas on 3/10/2018 . Ordered this based on my coworker's craving for a crumb cake like he had growing up on Long Island. It tasted great and stayed fresh until the last piece was gone. From Anonymous of Chico, California on 2/26/2018 . Since my Dad grew up on the East Coast I started looking for a crumb cake similar to the one he grew up eating as a child. When I discovered Hahn's and sent him his first cake (one of many) to my delight he said it was very much like what he enjoyed in NJ! He says it is delicious and authentic. Thank you for making such a great recipe! From Thomas Zurica of Valley Stream, New York on 2/26/2018 . From Anonymous of Great Falls, Virginia on 1/12/2018 . A former New Yorker, I have turned many people in VA on to the best crumb cake ever. From Barb of Manhattan Bach, California on 12/29/2017 . Sent a fabulous plain crumb cake to our son in Florida for the holidays. Arrived fresh and was as delicious as it always is. Never disappoints. Highly recommend. From Anonymous of Seaford , New York on 12/27/2017 . Very yummy! I ordered it for Christmas Eve because we received it as a gift at work and everyone enjoyed it! I loved ordering ahead of time and picking a delivery date. I have to say though, I was a little worried because I happened to see the delivery person “throw” the box onto my front step.. luckily the cake was fine because it was packaged very well..won’t stop me from ordering again! Too good! From KP of GLENWOOD, New Jersey on 12/27/2017 . Sent this to family in Florida and they loved it! Delivered on time as promised. Will definitely order again! From Brian of Jackson , Michigan on 12/25/2017 . It was great! Bought back memories of being a kid on Long Island. From william allison of the woodlands , Texas on 12/24/2017 . i ordered 3 of these for my children and siblings. Our Dad used to buy crumb cakes when we were young--my siblings said that these were even better than those Dad bought. My daughter said it was both the perfect breakfast and desert. The total "experience" from ordering to delivery to enjoying was one i am sure we will repeat. Many thanks. From Karen Gregory of Bethpage, New York on 12/23/2017 . Perfect gift for everyone on your holiday list. Always a hit! From Adriana of East Stroudsburg, Pennsylvania on 12/21/2017 . From Ray of Cobleskill, New York on 12/21/2017 . From Anonymous of Katonah , New York on 12/21/2017 . We sent this to our daughter’s teachers for the holiday season. They loved it and said it arrived fresh and that it was absolutely delicious. From Mimi of Oyster Bay, New York on 12/20/2017 . From Bob Verrastro of Palm Beach Gardens, Florida on 12/19/2017 . Perfect gift that's always a hit! From Anonymous of Los Angeles, California on 12/14/2017 . From susan bennett of morristonw, New Jersey on 11/27/2017 . From Anonymous of Woodstock, Georgia on 11/14/2017 . Delivered on the date requested, fresh excellent crumbcake. From Anonymous of Terra Haute, Indiana on 10/23/2017 . Sent this to my nephew as a college care package . This is his first year and misses the TLC from his mom. The Hahn’s coffe cake worked it’s magic. Thank you for all the love you put in this product. From Roy and Sarah McCollum of Cleveland, Tennessee on 10/18/2017 . My 90-year-old Dad grew up on Long Island and one of his many nice childhood memories was enjoying his mother's coffee cake. He has never had a cake since, that was like his Mother made. My Mom, his wife, finally gave up trying. I'm not sure this cake is 100% the same as his Mother's recipe, but it's the closest we've come and he's enjoying it. Thank you! From Anonymous of vero, Florida on 10/10/2017 . From Lee Ann Kent of Fair Lawn, New Jersey on 8/28/2017 . It was for my son's 29th birthday. He now lives in SC with his new bride. He said it was delicious! Thank you for making his day since I couldn't be there to celebrate with him. From roslyn steck of riviera beach, Florida on 8/20/2017 . From valerie sauber of Bonita Springs, Florida on 8/11/2017 . This is the crumb cake I've been looking for.Tastes like the cake my parents use to get when we were kids. Not too sweet, very crumby with big crumbs. Could not be any better. Can't stop at one piece. The best!!! From Anonymous of Mesa, Arizona on 8/8/2017 . 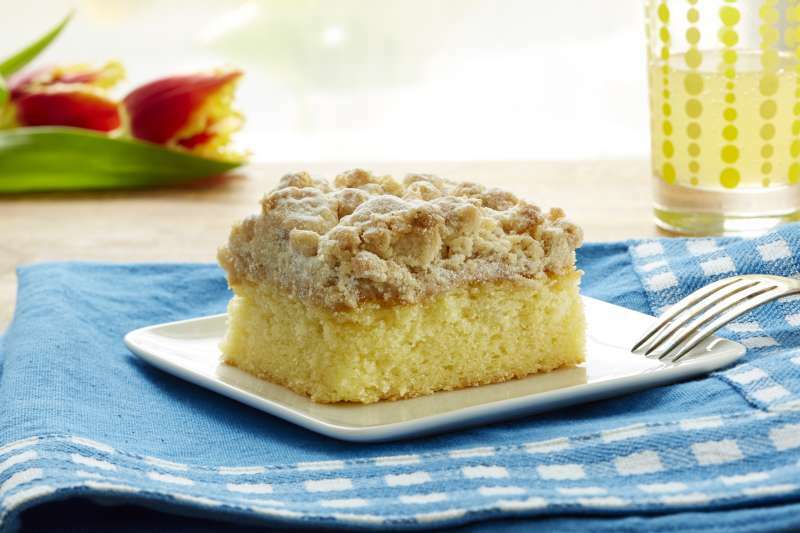 Classic, traditional, old fashioned - the texture and buttery taste of Hahn's plain crumb cake is memorable. A fantastic cake made even better thanks to the excellent service - highly recommended. From neen of Cape Coral, Florida on 7/6/2017 . My family and friends LOVE this cake .It always arrives fresh,and taste like it came right from the bakery.It is a treat not just for holiday gift giving.The Crumb Cake also Freezes very well. From Marty R of Stratford, Connecticut on 7/5/2017 . Sent this to a friend. He said it arrived very fresh . The only draw back was that there wasn't enough cake and delicious crumbs fell off cake. Over all he was quite satisfied. He ate it all in a few days and wouldn't share it with anyone. So that says it all. From Anonymous of Staten Island, New York on 6/30/2017 . Evocative melodies orchestrate a symphony of decadent texture mixed with sweet notes of butter and cinnamon as I lavishly consume my first slice of Hahn's Old Fashioned Crumb Cake. On the surface lies a deceptive form of an everyday pastry to be consumed with Styrofoam coffee on your way to work. But as you raise the weighty brick of sweetly spiced loaf, whispers of something greater float by your ear. Soon all memories of Styrofoam coffee, of adult responsibility, of ailments of the body and mind you've lived with for so long that you have forgotten they exist dissipate as you set forth on a personal journey to culinary bliss. From this point forth, words are rendered inadequate, for there is only Han's Old Fashioned Crumb Cake. And at the edges of this world are everything else that no longer hold any importance. From cynthia chick of palm beach, Florida on 5/24/2017 . Folks, this is wonderful. It is moist, it showed up perfectly packaged and intact, and it freezes beautifully. Everyone is enjoying it, and it will now be a staple in our home. FABULOUS!!!!! From Anonymous of Palo Alto, California on 5/17/2017 . Super awesome...as a gift for my 90 year old mother, the crumb cake took her "home" to Brooklyn and those crumb cakes from Ebingers Bakery! Well done, we will order again and again!! From Kim McIlvain of Henderson, Nevada on 5/16/2017 . My parents are from NY and haven't been able to get good Crumb Cake since moving to NC. I ordered a Crumb Cake for my mom for Mother's Day and she loved it. She said it was just like they used to get back in the day. From Anonymous of Basking Ridge, New Jersey on 5/15/2017 . Sent the crumb cake as a house warming gift and they called right away to say how delicious it was! From annette turello of crestwood, Kentucky on 5/5/2017 . I'm from Queens,NEW YORK,living in KY.They do not know what crumb buns are here,this is just like the crumb buns i use to get from the bakery every SUNDAY,So good,when i get thur is batch i want to try the APPLE. From Janette Ketcham of Nassau Bay, Texas on 4/20/2017 . Hahn's crumb cake is the quintessential reminder of my NJ childhood. I immediately harken back to Sundays after church or weekend brunch with my aunt and uncle at the Jersey shore. It is my childhood on a plate. Thank you Hahn's for delivering the delicious memories! From Mary Lisa of Bethlehem, Pennsylvania on 4/12/2017 . From Anonymous of Los Angeles, California on 4/2/2017 . From Madeline O&#39;Brien of Merrick, New York on 3/29/2017 . The recipient of the cake raved about it and got accolades from guests he served it to. From LMigash of Mechanicsburg, Pennsylvania on 3/12/2017 . My mother turned me onto Hahns coffee cake after receiving one. The coffee cake is very large and delicious. What a unique gift to receive. I sent this to friends who were hosting my daughter and they were so excited to receive it! Hahns got it out in a timely fashion with very short notice. Highly recommend this product and company! From Anonymous of Supply, North Carolina on 3/11/2017 . We sent Hahn's Crumb Cake as a 80th birthday gift to a dear friend in New Jersey! He was overwhelmed with the crumbs and taste! He said, "it was the best crumb cake he has ever had!" Thank you for making the best crumb cake here on the East Coast!! From John F of Navarre, Florida on 3/9/2017 . Growing up on Long Island I had Crumb Cake every Sunday. When I moved away in 1987 I only had Crumb Cake when I visited NY.. It is so awesome that I get to not only eat this but introduce friends to crumb cake. It also makes a great gift for people in and out of NY. From Carlos De Souza of Cooper City , Florida on 3/8/2017 . Friends introduced us to these cakes. Love them. From Rosemarie Liosi of N. Massapequa, New York on 2/14/2017 . Sent this cake to my daughter in Staten Island for the family - they love it!!!! Will definitely be ordering again (for myself)!!!!! I love it as well!!!! From MF Hibbert of Atlanta, Georgia on 2/5/2017 . I sent Hahn's Plain Crumb Cake to my brother in law in Texas. He is recovering from pneumonia and had lost his appetite. He loved it!! He said it was the best Crumb Cake he had ever had. From annie of new rochelle, New York on 2/3/2017 . the best taste and so moist. From Linda Morey of West Melbourne, Florida on 1/30/2017 . My dad loves this crumb cake so much that I try to buy it for him for every occasion. From Philip McWeeney of Massapequa Park, New York on 1/10/2017 . From Allan Kammerer of Townville, South Carolina on 1/8/2017 . From Anonymous of ISLIP, New York on 12/29/2016 . From Diana Zeda of Levittown, New York on 12/29/2016 . The crumb cakes were delicious. Everyone raved about them. Thank you for doing what you do. From Dennis OBrien of Branchburg, New Jersey on 12/28/2016 . in South Brooklyn many years ago. From Anonymous of Baldwin, New York on 12/28/2016 . From Anonymous of Janesville, Wisconsin on 12/26/2016 . This was our first time ordering from Hahn's and thought we would give it a try for holiday gifting in the future. I ordered it over a month ago to arrive just before Christmas, and it showed up on the day it was promised and was very moist and flavorful. Everyone that we have had over as company for the season has enjoyed it and wanted to know where we got it from. We will definitely be ordering again. From H Pinkus of Massapequa, New York on 12/21/2016 . Easy to order- was a gift- receiver impressed with quality & taste. From Ann Carraher of Brooklyn, New York on 12/21/2016 . This was given as a Christmas gift and it arrived on time and by all accounts it is a delicious crumb cake. From Beth Hallahan of Gansevoort, New York on 12/21/2016 . Saving for all the family Christmas morning. It is a tradition. Always delicious. From Patrick Regan of Milton, West Virginia on 12/20/2016 . As a child, my Aunt Margaret would walk blocks to have crumb cake for my visits to Queens. I ordered this as a treat for my 67th birthday. Moist delicious crumb cake arrived in 2 days. Childhood memories flooded my find as my taste buds rejoiced. Thank You. From Gloria Sands of Cary, North Carolina on 12/19/2016 . From Gail Adams of Leesburg, Virginia on 12/19/2016 . enjoy ourselves. If there is any leftover, it goes in the freezer for a birthday. I think we have already ordered eight this month...gave one to my boss for his weekend company. He sent a text message at midnight -- said he could not wait and that it delicious! And, it is! From holly Stevens of Lakewood, Ohio on 12/19/2016 . From Anonymous of Woodstock, Georgia on 12/19/2016 . No problems with purchase or delivery. Excellent service and quality taste. Easy to order online. Will use them again. From NonniJ of Peekskill, New York on 12/18/2016 . I'm sharing mine with a good friend who is also "crazy for crumbs". From Barbara Holder of Cadillac, Michigan on 12/17/2016 . I used to buy the Crumb cake a long time ago and I decided to order one for my sisters family for Christmas. My Sisters Grandaughter was so happy when she opened her lunch at school and found a piece of this crumb cake in her lunch. Made her day. Thanks Hahn's. From Steve Marshall of Batavia, Illinois on 12/8/2016 . These plain Crumb Cakes are great. So so good. From Van Hicks of Chicago, Illinois on 12/4/2016 . Delicious coffee cake topped by huge layer of wonderful crumbs. It's the best ever. Its by far my favorite. From Anonymous of Sauk Rapids , Minnesota on 12/4/2016 . Delicious! Delivered right on time! Thank you! From Rosemary Bailey of Stockholm, New Jersey on 11/27/2016 . My entire family loves this crumb cake, I will be ordering more for Christmas. From Loo of Savannah, Georgia on 11/26/2016 . As always ... wonderfully delicious! From christopher of lake louise, Alberta on 11/10/2016 . From Terri Heckman of Akron , Ohio on 9/28/2016 . This is the best damn stuff in the entire world! From Anonymous of Palm City , Florida on 9/6/2016 . Been ordering for years and still the best. From Anonymous of Pittsburgh, Pennsylvania on 9/5/2016 . Best Crumb Cake Ever!!! Great to send for any occasion! From Anonymous of Yonkers, New York on 8/3/2016 . Best crumb cake East of the Mississippi ! best crumb cake I've ever had! From Anonymous of Summit, New Jersey on 8/1/2016 . I bought this for the first time at shop rite. They don't always have it in stock, so I saved the label and tracked down this bakery. I'm obsessed with it! From Anonymous of So San Francisco, California on 6/28/2016 . From Anonymous of Staten Island , New York on 6/22/2016 . Delicious!!! The cake is almost gone within 3 days! From K. Flores of Bowie, Maryland on 6/8/2016 . I had this cake shipped to my Dad for his birthday. The delivery was on time and he loved the cake. He shared and it was delicious! We'll definitely be ordering again. From Richard McManus of Venice, Florida on 5/29/2016 . From Anonymous of Leesburg, Florida on 5/29/2016 . Was in NYC on vacation and stopped in a market and picked up a box of Hahn's crumb cake. It was the best I ever had. Very moist! I only wish I lived closer to a distributor. From C Maureen Mathews of Huntington, New York on 4/27/2016 . From Anonymous of great neck, New York on 4/24/2016 . cake was very very good. delivered promptly. From Madeline Porter of Mt Perry, Ohio on 4/18/2016 . Fabulous cake! Just like I remember from years ago! From Anonymous of Virginia Beach, Virginia on 3/6/2016 . Sent as a thank you ! Arrived in two days and the recipients loved it! Delicious and so easy to send! From CAROLYN BLACK of ATLANTA, Georgia on 2/29/2016 . Not only is this the best crumb cake ever, it was a terrific gift for a family member recovering from surgery. He was thrilled when he received it! A gift that the whole family can enjoy. Additionally appreciate the prompt and speedy delivery (as promised). Will order this again. From Anonymous of Farmingdale, New York on 2/15/2016 . A crumb cake was sent to family in Florida for Valentine's Day. Cake was a huge hit! They loved it and were very impressed with the packaging upon arrival. From Anonymous of Babylon, New York on 2/10/2016 . Having had the Plain Crumb Cake myself, I ordered for freinds for their anniversary. They called to say they absolutely loved it. From Anonymous of Bandon, Oregon on 2/9/2016 . We hadn't had this cake in years. So we ordered it for a birthday and we were not disappointed. It arrived on time and everyone loved it. Would order again. Best crumb cake we've had. From Steves0113 of Massapequa, New York on 2/5/2016 . From Anonymous of Fairfax, Virginia on 1/24/2016 . Received my first one as a gift for Christmas! Absolutely loved it. Wegman's used to carry an amazing crumb cake with huge crumbs but they discontinued it. This is the first crumb cake that I have had in years that was better than that! From Paul Griffin of Smithfield, Rhode Island on 1/12/2016 . This is the best crumb cake I have ever had! From Anonymous of Babylon, New York on 1/10/2016 . Absolutely fabulous. Would order again and often. From Pamela DiVita of Whitestone, New York on 12/30/2015 . Everything is Fantastic: easy ordering, fast service and fresh delicious crumb cake! Maybe you can incorporate the purchase of a "small" bucket of crumbs when ordering a large crumb cake for delivery instead on just the large bucket. Hahn's is great! Best ever... it's just that simple!!! From Anonymous of Indian Trail, North Carolina on 12/30/2015 . We used to go and pick this all the time for special occasions when we lived in NY... now we just order it! From Vicki of Laguna woods, California on 12/29/2015 . I miss east coast bakeries. But a friend sent me a crumb cake for the holidays and I will never miss real baked goods again! This crumb cake is beyond fabulous!!! From Anonymous of Middle Village, New York on 12/28/2015 . We have purchased the plain crumb cake before and never been disappointed. The cake arrives nicely wrapped and tasting fresh all the times. From Anonymous of Shoreham , New York on 12/27/2015 . From Anonymous of lake grove, New York on 12/26/2015 . i got this as a secret santa gift and i loved it so much! From Ryan Eden of Holtsville, New York on 12/24/2015 . Most delicious crumb cake I, or any of my friends or family, have ever had. From Anonymous of Hauppauge, New York on 12/23/2015 . A really great crumb cake. Everyone one that has received it has loved it. From Judith Orobona of Valley City, Ohio on 12/23/2015 . "Delicious" said my recipient!! I will definitely send this crumb cake again and again! From Anonymous of Palm Beach Gardens, Florida on 12/22/2015 . This is the best crumb cake ever! Always fresh and a crowd pleaser. Great service and delivery. From Kathleen Sciandra of Smithtown, New York on 12/21/2015 . and delicious and I eat a piece every morning. From Marilyn Dutkus of Eureka, California on 12/17/2015 . This cake is the standard by which others are judged. If you love those moist, yummy crumbs atop a super moist cake this is for you! Comes well packaged and fresh. From Ciara Stupp of Millville, New Jersey on 12/16/2015 . We have been given these cakes as gifts in the past from a vendor, now this year we purchased 15 to give to our customers (and one for us too). They are delicious!! Thank you for an amazing quality product! From Anonymous of Jackson, New Jersey on 12/15/2015 . Crumb Cake wonderful as usual. Only thing was that when I ordered previously the cakes were wrapped individually. I sent to my Brother in a rehab center and individual wrapped would have been better. Cake was wonderful. From Linda H of Lake Wales, Florida on 12/7/2015 . Bought the plain crumb cake for my husband and he just absolutely loves it!! Will definitely buy it again! Thank you! From eleanor lantvet of cooperstown, New York on 12/3/2015 . if you enjoy alot of crumbs this is it. the top was heavy with crumbs and bottom was a delicious soft cake. the best i have had in years. and it arrived fresh. From Brenda Crawford of North East, Maryland on 12/3/2015 . We received this at our office it was the best crumb cake I have ever had. I actually on the same day sent one to my Aunt in NE. I am definely hooked and will be trying different ones! From David Wilcox of Vail, Arizona on 11/29/2015 . Eureka!! We have found our newest family holiday tradition and it is a little piece of heaven! Do your taste buds a favor and get your own Plain Crumb Cake. Once you try it, you will agree that it is something "out of this world!" From Anonymous of Homewood, Illinois on 11/26/2015 . Have always loved these crumb cakes. Will continue to order them for family in the Midwest. From Doug of Deerfield, Illinois on 11/22/2015 . I received the crumb cake 3 days after I ordered it online. The flavor was wonderful and the cake itself was so moist. I really liked the topping, too, which was not too sweet but just right to add to the flavor of the cake. I savored each piece as I ate it and it went so well with coffee or milk. I served it to guests and they loved it as well. I though the crumb cake at Fragapane's bakery in North Olmsted, Ohio was hard to beat but this one gives it great competition. I am definitely going to order from Hahn's again!! From Anonymous of Easton, Maryland on 11/10/2015 . Received this as a gift and now send it to others. A real treat, fairly priced and excellent service. From Anonymous of Castine, Maine on 9/14/2015 . This was great to be able to get from Hahn's.Arrived in excellent shape despite the long distance that it was mailed.It did not last long at my house!Just like being back on Long Island. From Tony of Philadelphia, Pennsylvania on 9/1/2015 . From Domenick Versaggi of Philadelphia, Pennsylvania on 8/26/2015 . Always enjoy the crumb cake. From Camille Silva of Seagoville, Texas on 8/19/2015 . I have never eaten such a delicious cake!! From Anonymous of Raleigh, North Carolina on 8/16/2015 . Ordered a crumb cake from the site on a Wed and got it that Friday! The cake is fresh and delicious. It's even better looking than the picture. The crumbs are big and cinnamony. From welch adella of Maple Shade, New Jersey on 7/17/2015 . From Barbara Friedman of Fort Myers, Florida on 7/8/2015 . We greatly enjoyed this wonderful NY style crumb cake! So glad we found Hahn's on the Internet. As former New Yorkers, we have found nothing of this quality here in Southwest Florida. Thank you. From Anonymous of Jackson, New Jersey on 7/7/2015 . Rich delicious and always fresh the best crumb cake I have ever had. From Carolyn Isler of Dallas, Texas on 6/22/2015 . This is hands down the best coffee cake ever! Great gift. From nancy oconnor of howard beach, New York on 5/27/2015 . I SENT THIS CAKE TO MY AUNT FOR HER BIRTHDAY AND I WAS SO HAPPY TO LEARN THAT IT HAD ARRIVED ON FRIDAY WHEN I ORDERED IT ON WED. SHE SAID THE CAKE WAS HUGE AND VERY, VERY DELICIOUS. From Anonymous of New York, New York on 5/25/2015 . Excellent taste! Send as gifts and everyone loved it! From Julie of Greenville, Illinois on 5/24/2015 . I have a dear family member give one of these crumb cakes to my family. It is the best thing I have ever tasted. Will be ordering for myself in the future. From Jeanne Lathrop of Huntingdon Valley, Pennsylvania on 5/23/2015 . From Anonymous of Miller Place, New York on 5/19/2015 . Someone gave me this crumb cake as a gift a few years back. I was hooked at first bite. I buy them as gifts for my relatives and friends. The mailorder service is excellent. They send you an email when it's being delivered. It arrives when they say it will. You can also write a personal note for the person receiving the crumb cake. I highly recommend this amazing crumb cake. From Sabrina of New Haven, Connecticut on 5/18/2015 . First tried this over the holidays and was blown away. Ordered again because the taste is unforgettable. Now the family is hooked. This will be our new holiday treat to ourselves every year. Next up...apple crumb I'm sure. From Anonymous of South Kingstown, Rhode Island on 5/12/2015 . I received a crumb cake from Hahn's as a gift and now I intend to always send it, it is delicious! From adwlla welch of maple shade , New Jersey on 3/23/2015 . From Anonymous of Roslyn, New York on 3/11/2015 . As soon as you bite into this scrumptious crumb cake, you get the feeling that it was just freshly baked by your grandmother; old world taste, so satisfying, fresh and absolutely delicious. Only caution is once you take your first bite, you won't be able to stop!!!! Makes a great gift to warm someone's soul!!!! Must Try! From Marcia of Brooklyn, New York on 3/2/2015 . This cake is perfection! I often give it as a "thank you" gift and it is always enjoyed and appreciated. From Patricia Coccaro of bellmore, New York on 2/16/2015 . From May Saubier of upstate, New York on 2/10/2015 . This is a delicious cake that was given to me once and now I send it whenever I need a reliable gift for someone. Highly recommend! From Richard Kiernan of Beaverton, Oregon on 1/19/2015 . From AB Container of Enfield, Connecticut on 1/12/2015 . From Paula Thompson of Jupiter, Florida on 12/31/2014 . My brother was kind enough to share some of his Christmas gift - Old Fashioned Crumb Cake. Only a bakery on Long Island, can make crumb cake with lots of hug crumbs, a definite 5 Star Rating! It was delicious! From Margaret Rausch of Nashville, Tennessee on 12/30/2014 . From Eileen Bach of New York, New York on 12/29/2014 . The term old-fashioned is very appropriate and the cake received many compliments. Shipping was prompt and delivery, even in bad weather, had the cake arrive in time for Christmas. Thanks, Hahns! From Joel of Providence, Rhode Island on 12/29/2014 . I remember the first time I was introduced to this crumb cake back in November of 2011. The cake bed is fluffy and moist while the crumbs are perched on top like an eagle in a tree. We have received this cake as a thank you gesture for the last 4 years from a business partner in the Long Island area. This year i decided to order my own and bring it to Christmas dinner. It was far and away the most successful part of the day. Thank you Hahn's! From Fiore Tierno of Macomb Twp, Michigan on 12/29/2014 . Hahns Old fashioned Crumb cake is awesome. It brings you back to your childhood immediately. Thick layer of crumbs on a thin layer of cake to hold them. Being from NY , this is a great product to send or receive out of state. From Margaret Frame of Gaithersburg, Maryland on 12/28/2014 . This Old Fashioned Crumb Cake is becoming a holiday tradition for our family! From Richard J Beyers of Dumfries, Virginia on 12/26/2014 . The best crumb cake I've ever had. From Carol Pearce of Las Vegas, Nevada on 12/26/2014 . From Tina Fisher of Smithtown, New York on 12/26/2014 . This item was sent to relatives out of town. Their response was - I am not sharing with anyone - this is the best crumb cake ever. From Anonymous of six mile, South Carolina on 12/26/2014 . This is an excellent crumb cake. More crumbs than cake, just the way everyone likes it! From Marlynn Cohen of Old bethpage, New York on 12/25/2014 . We bought this as a gift for a friend who lives in NJ and can't get to your store. He loves the product. The delivery was timely and he was extremely happy with the cake. From Ellen Rindfleisch of Naples, Florida on 12/24/2014 . We searched for years to find a good NY style crumb cake. This is it! The crumbs are huge and now you can buy them by the bucket to finish your own recipes. Makes a very popular gift. From Mary of East Hampton, New York on 12/23/2014 . This is the best crumb cake ever! The cake is very moist and the crumbs are big and yummy! It ships well and freezes well. I send the cake to my daughter in NC, and she is thrilled with the gift. From Mark of New York, New York on 12/21/2014 . Cake arrived very quickly and my friend was delighted. From Edward and Debbie Lauda of Woodstock, Georgia on 12/17/2014 . I sent this cake to good friends who loved it. Delivery time and date was as promised and the cake was fresh and delicious according to my friends. I have personally had the crumb cake and it was the best I ever tasted. From HB of Flushing, New York on 12/14/2014 . Our family received an Old Fashioned Crumb Cake as a holiday gift. We loved it so much we in turn sent one to our son in college in Boston to enjoy with his friends. They loved it just as we did! It arrived in perfect condition and fresh. Will order again! From Carol Hahn Boykin of zephyrhills, Florida on 12/14/2014 . I ordered the crumb cake because I too am a Hahn. I received my cake on the date requested and was delighted with the cake. Since I could not purchase it locally I had to order on line and have it shipped. The cake was priced right and quality was excellent, I was pleased by the cake. I just wish I didn't have to have it shipped to me due to the added expense. From Lynn Hutchinson of manchester, New Hampshire on 11/28/2014 . Always great! Born and raised on Long Island, just can't get this great stuff here. The best crumb cake you can buy. From Stephen Riggio of BERNARDSVILLE, New Jersey on 11/25/2014 . Insanely delicious! Quick delivery and great service. From Anonymous of Manhasset, New York on 11/20/2014 . Nothing to say but gets better everytime I eat it. From Caroline Congro of Bronx, New York on 10/14/2014 . I already posted a review on your website. From Judith Ferber of New York, New York on 10/13/2014 . If you ate crumb cake when you were younger . . . Hahn's Old Fashioned Crumb Cake will bring back those memories. The taste, smell and freshness are truly intoxicating. From Theresa Verdi of Milford, New Jersey on 9/8/2014 . From Steve of Roseville, California on 8/25/2014 . When I lived in South Jersey getting a NY crumb cake wasnt difficult. L & M Bakery in Delran, NJ made just about the best crumb cake. This one from Hahn is just about as good. Rich flavor and very big crumbs. From ORALIA MARKLAND of WANTAGH, New York on 8/24/2014 . We were recently in Texas visiting friends who moved from Long Island to Dallas many years ago. They lamented that they couldn't get good crumb cake there. When we returned, I sent a Hahn's Old Fashioned Crumb Cake. This is their emailed thank you: "WOW! Best crumb cake ever! Cathy (their adult daughter) just had a piece. Wants more." "Nuff said! From Sherri Smith of Stafford, Virginia on 8/13/2014 . This cake is delicious. It is a large cake. The crumb topping is not too hard nor too sweet and the cake is tasty. It was somewhat crushed at one edge during shipping. And, I was surprised that it was shipped without any wrapping around the cake before being put in the box. However, despite the damage, the cake is well worth ordering. From Michael silecchia of lyndhurst, New Jersey on 7/27/2014 . Be sorry you did.MIKe S.
From Anonymous of Pennington, New Jersey on 6/18/2014 . My husband loves crumb cakes and my daughter sent him your for Father's Day... It is the best we have ever had. The cake is so moist and the crumb topping wasnt too sweet, just perfect! We will definitely be ordering from you again!! From Patricia Pellegrini of Leonardo, New Jersey on 5/16/2014 . I received a crumb cake as a gift & shared it with family at an Easter Brunch. The Northeasterner's loved it so I decided to send it to cousins in Arizona. The cake was delivered on time and was a big hit. The recipients said that they hadn't had crumb cake in years & that it was a great way to bring back sweet memories. Bravo!!!!!! From Joseph Reinhard of Dover, Pennsylvania on 5/11/2014 . I haven't had as good a crumb cake as this is for a great number of years. It seems there aren't many people left who are willing or able to produce good products like this. Please keep up the good work. From Vincent Cremona of Palm Bay, Florida on 5/11/2014 . From Anonymous of Port St. Lucie, Florida on 5/11/2014 . I had the cake delivered to my work. It was a huge hit. The cake was gone in no time. Just like we remembered crumb cake! We will definitely do this again. From Chrissy k of Doylestown PA, Pennsylvania on 4/22/2014 . Great crumb cake possibly the best I ever had!!! Don't hesitate to order this cake you will not be disappointed ! From Anonymous of Carrollton, Texas on 4/22/2014 . This crumb cake was the best. Just like old times!!!! My whole family loved it. We can't get anything like this in Texas. From Anonymous of Warwick, Maryland on 4/20/2014 . I sent it as a birthday present, he loved all 4 lbs! From Robert Staab of Phoenix, Arizona on 3/30/2014 . Excellent just like I remember back in NY, shipping a little high but worth it, received fresh and delouses, will order again. From Marilyn Oertel of Rio Rancho, New Mexico on 3/27/2014 . Your cake is to die for. How would I get a discount coupon from your company. I will be ordering more cakes this year. From Lois of Jensen Beach, Florida on 2/24/2014 . What a great treat this cake was for my father's 80th birthday!! He came from New York and really appreciated the quality of the cake. It brought back memories. From Elliot Gould of Sandown, New Hampshire on 2/17/2014 . Our family has been enjoying Hahns crumb cakes for years. Great cake. Even better crumbs. Couldn't recommend them enough. From Gerri K. of Middletown, Delaware on 2/17/2014 . We sent as a gift and they loved it! From Gerri K of Middletown, Delaware on 2/17/2014 . From Emily Leone of Redondo Beach, California on 2/10/2014 . I get this coffee cake from my boss every year and I love it!! From Patricia McLaughlin of South Bend, Indiana on 1/22/2014 . From nancy mcclaren of west newton, Pennsylvania on 1/16/2014 . From Michelle Olk of Monmouth Junction, New Jersey on 1/3/2014 . Crumb cakes were loved by everyone that tried it!! Will be ordering again! From William Doll of Minneapolis, Minnesota on 11/21/2013 . No one on the planet does crumb cake better. The crumbs are to die for--the secret to a great crumb cake. From William Kane of Washington Crossing, Pennsylvania on 11/11/2013 . From Anonymous of stockton, California on 11/10/2013 . was very good. Was a birthday gift. made him really happy. He grew up in New York. Brough back good memories. From Anonymous of Lynbrook, New York on 11/5/2013 . I sent to my daughter and her family in Virginia, they loved it. Arrived in perfect condition..fresh and tasty. From Sheri of Port Charlotte, Florida on 10/13/2013 . This cake was amazing. Moist and delicious and a generous size. Oh, and the giant crumbs - amazing! Will order again and again. Now that I tried it myself I am comfortable sending it to friends and family as a holiday gift or birthday present. Very impressive! From JOSEPH of CANTON, Ohio on 10/10/2013 . From Barbara Benko of Wesley Chapel, Florida on 10/2/2013 . I sent this crumb cake to my Aunt in New Jersey for her birthday. She said it was the best!!!!!! It was very fresh, and her whole family enjoyed it. It also arrived for the day I selected with no shipping problems. Thank you for making my Aunt's day! From michael moyles of charlottesville, Virginia on 8/26/2013 . cant go wrong, wonderful quality, like the good ole days! From JODY JOHNSON of Las Vegas, Nevada on 8/26/2013 . Perfection! best crumbs, cake always fresh!